The CSX SD60 by AM on Chemung Valley Lines trackage. Click image for a larger view. 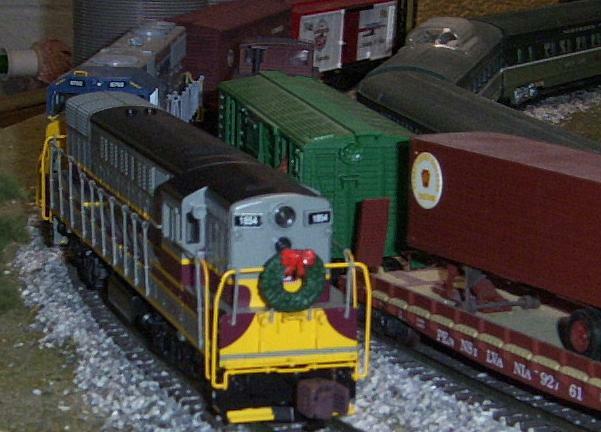 The crew of this TM by AM has decorated their loco for the holiday. Click image for a larger view. Here is an American Models Budd car populated with MTH people. I got a pack of 100 unpainted people from Doug Peck a couple years ago. Compared to painted figures they were a very reasonable price. Notice how much better 3d people look in the car, compared to printed profiles or opaque windows. The level of detail applied in the painting wasn't great. but I think the effect is great. 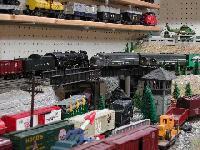 This site is dedicated to promoting S gauge Modular Model Railroading in American Flyer, Scale and HiRail. As we build info. on modules remember that some of it will be useable for all scales. -The RIT Model Railroad Club presents its Tiger Tracks Train Show in the Gordon Field House, Henrietta, Saturday & Sunday, Dec. 5&6, 2009, 10 AM - 5 PM on Saturday & 10 AM to 4 PM on Sunday at the Gordon Field House, Rochester Institute of Technology, Rochester, NY. For obtaining information about NASG S module standards use the following links. Printed material is available at the NASG site for a very nominal cost. NASG S Mod Happy Training! 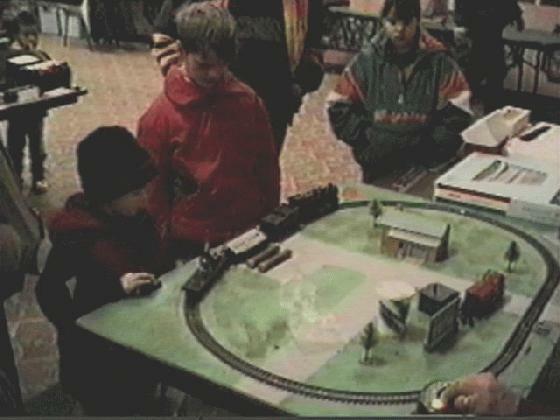 Below are a couple of pictures of our modular layout as set up in Caledonia NY at the Big Spring Museum. You can see the new 3 track yard modules with backdrops. These modules have now been fully scenicked. Click on them for a bigger picture. 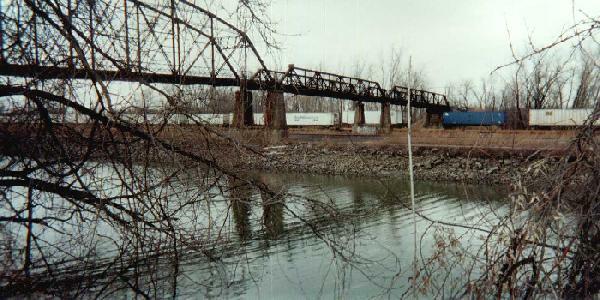 Here's a CSX trailer train running on the old NYC tracks alongside the Erie Canal at the old Lyndon Ave. bridge near Fairport NY. This was Ted Larson's favorite train watching spot, a few hundred yards from his house. He has since moved back to Minnesota and the bridge has been replaced. He started the RASG and for a short while there were just the 2 of us. We are members of the RASG (Rochester Area S Gaugers) in upstate New York. We are always looking for new members and welcome anyone interested in scale, hirail or AF. E mail us if you have any interest or curiosity. We have four 90 degree turn end modules of 4'x4', two 2' long bridge modules and six 4' long straight modules to form an 8' x 22' or a 10' x 20' foot scenicked layout when assembled. We last had our modules with the old 2 1/2' x 5' 180 deg. 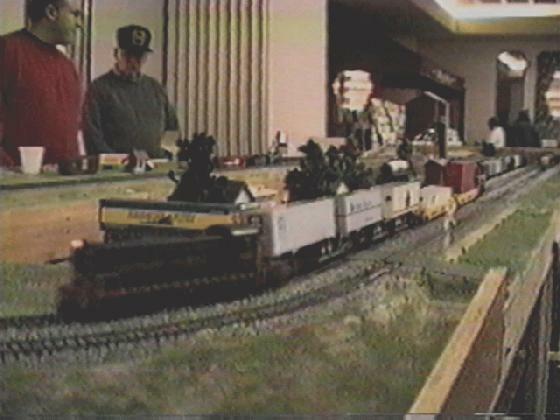 turm end modules running at a train show in the Buffalo, NY area in Jan. 1996, Since then we have used our larger radii end modules which allow us to run a PRR GG1 on the inner loop without the overhang bothering the cars on the outer loop. We first set the layout up again with these new larger radius "S72" end modules at Batavia NY in March of 1997, and we have used them ever since. 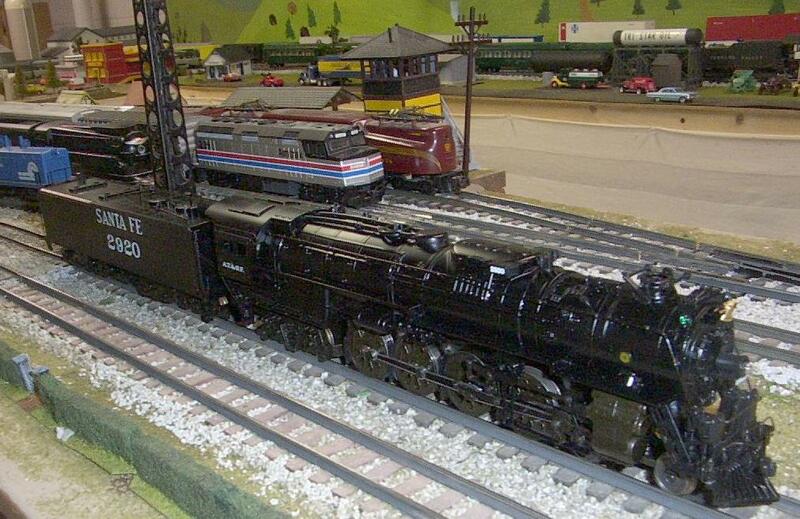 We have had some local (Rochester, NY) TV coverage with a video which had some some great shots of our layout. Click on the thumbnail JPEG pictures below to see larger images. 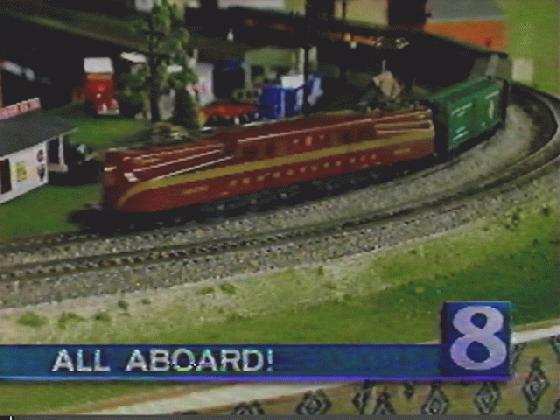 Here is a picture of Chuck Smith's GG1 pulling express reefers and PRR heavyweights around the bend on one of the new corner modules as shown on local TV 3/9/97. 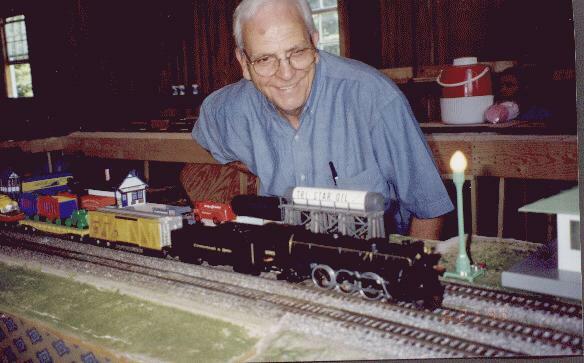 Here's Mike Shea of the RASG (at least his hand on the transformer) helping a youngster dump logs on our small action car display layout. This layout is a great hit with the younger set. Here's Ray Abbot and Mike Holland of the RASG and a train of AM spine cars belonging to Ted Larson and Chuck Smith's Des Plaines Hobbies container cars. We were set up again for the TTOS Convention here in Rochester NY on August. 15th and 16th 1997 with 16 feet of new modules under construction included. Our layout was 8'x24'. 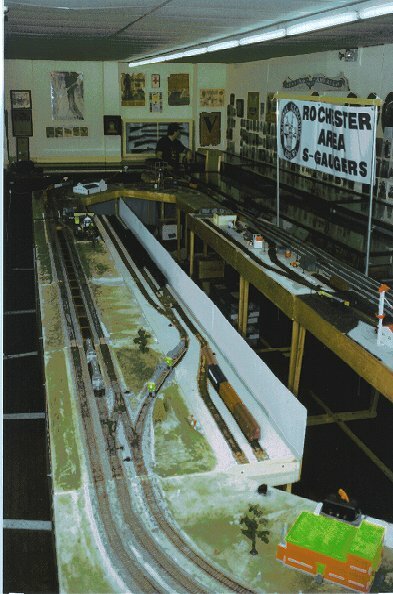 We were set up again on Sept. 13th and 14th 1997 in the High Falls area in Rochester at the High Falls Museum building with a 12'x24' foot layout. We now have the capability to go up to 10'x28'. 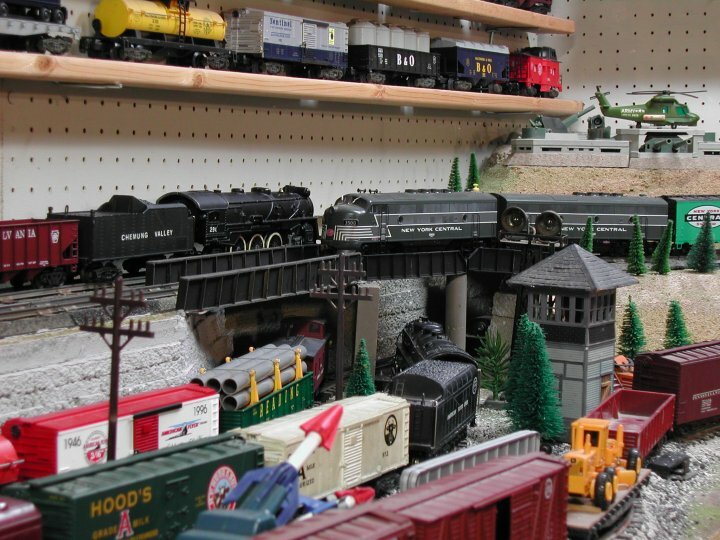 The following shots are from my home layout. 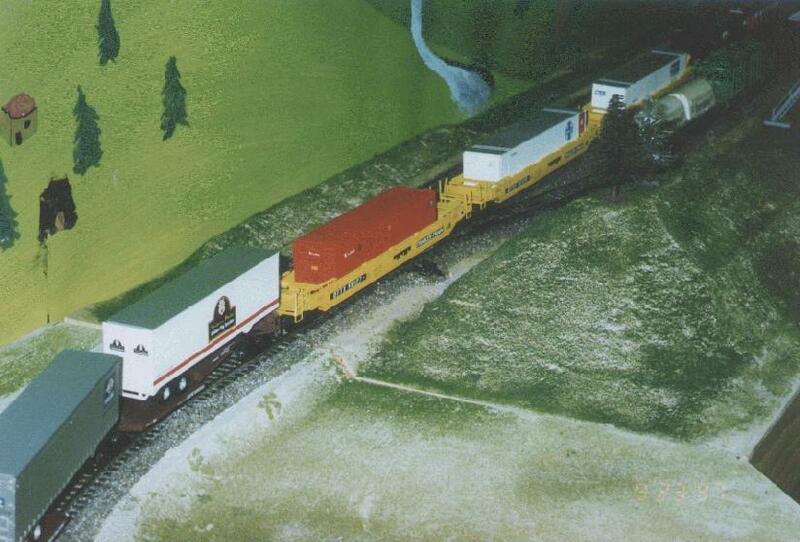 Here is a shot of AM Pennsy GP9s coming off a corner module that was once incorporateded into my home layout. 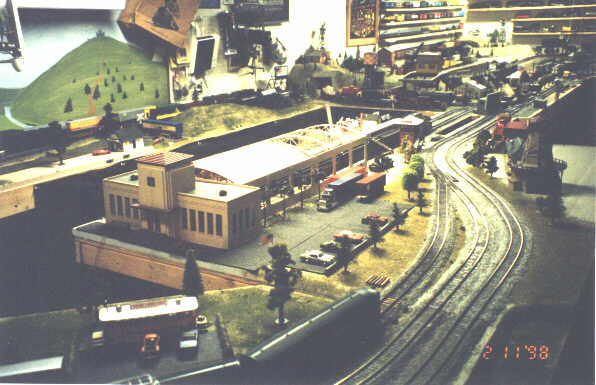 Here is a shot of the west end of the terminal area, showing a GG1 with Budds, a Superliner, and PRR K4 with heavyweights backed into the terminal. An SW-9 is switching express reefers. As you can see the Gargraves looks very much better when ballasted. 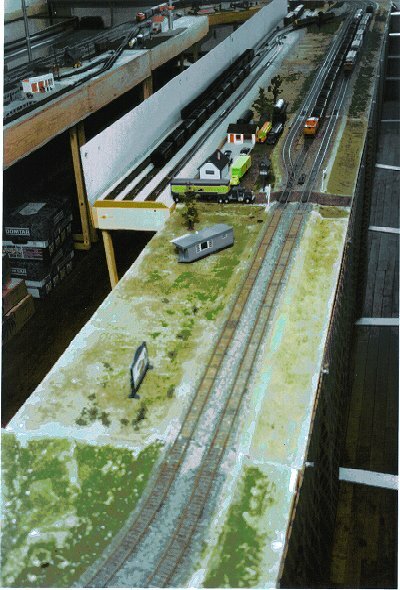 Here is the SW corner of the layout, on Flyer and Gargraves track. AF steamer meeting SHS F3s on upper level, AF Hudson waiting for a string of Lionel and K-Line cars to pass by on the lower level. The Erie Lackawanna and Lehigh Valley RS3s are lashed up on the front of this freight on the scale line. 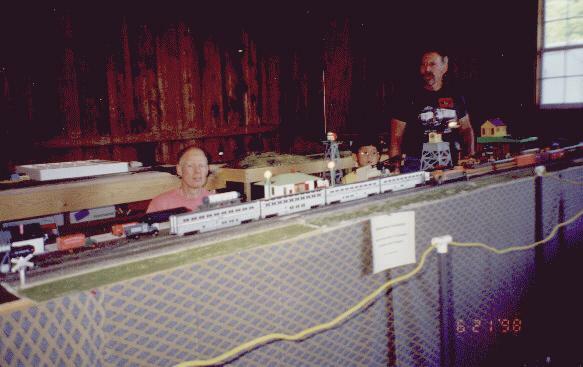 Ted Larson, Rick Isrealson and Ted's son Jeff manning the modules at Genessee Country Museum on Father's Day 1998. Here is a shot of me with my new AM Pacific pulling Roger Delthony's circus consist at Genessee Country Museum on Father's Day 1998. 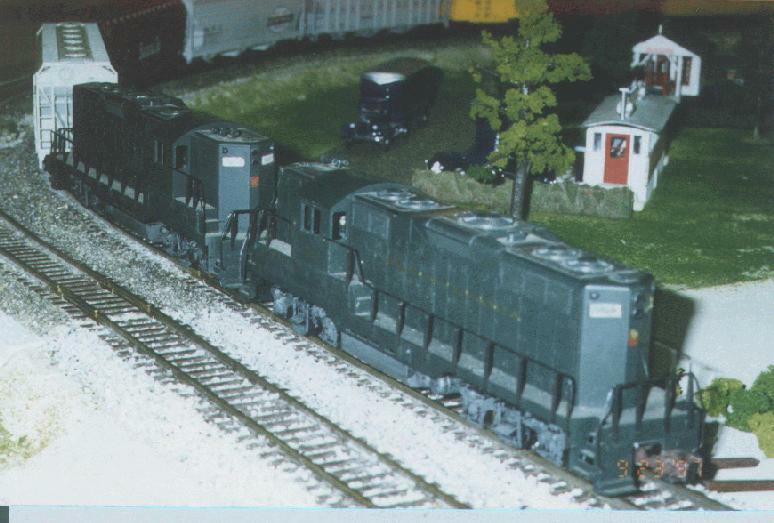 Here is motive power parked at the east end of the CVL terminal area once again on my home layout. A subscription to the Dispatch, a bimonthly publication containing information on recent developments and products, club activities, projects, layout articles, convention activities, and more. 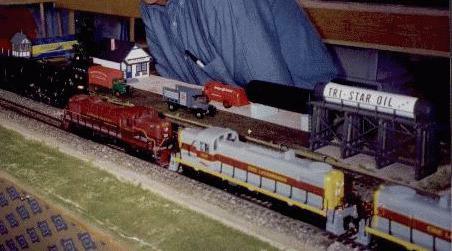 Both toy and model trains in S (1/64th) scale are covered. American Flyer Car Committee: produces custom members only AF freight cars yearly. 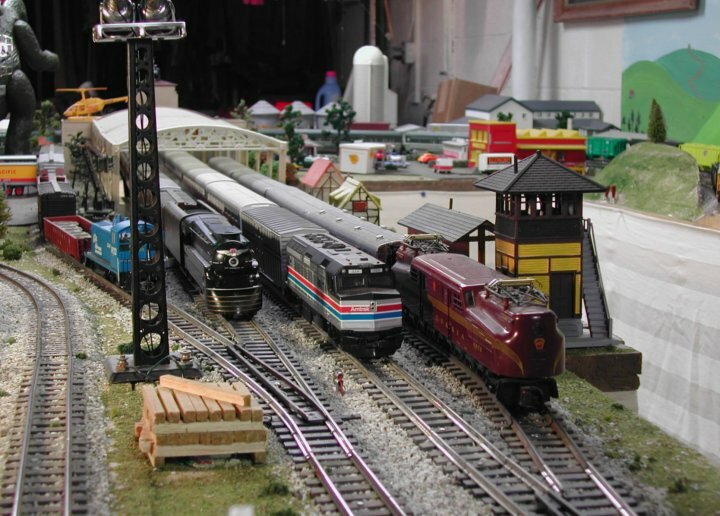 NASG Freight Car Committee: produces custom members only model freight cars yearly. Conventions: yearly, in various parts of the country, generally in July or August. S-MOD: a standard module system that ensures electrical and physical compatibility of modules. Standards: track and wheelset standards are maintained by NASG, and gauges to these standards are offered. Clearinghouse: NASG caps, patches, pins, T-shirts, golf shirts, AF t-shirts are available to members.